You can add a wrapped noseband to your halter. 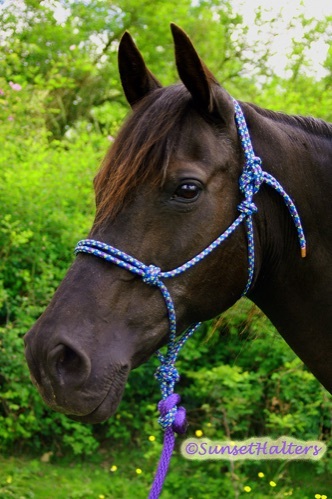 "Satin" is shown here wearing a yearling/cob purple/pacific/lime 5/16" diamond braid rope halter, with a purple 5/8" derby rope lead (sold separately). We use a fiador knot at the chin, our special throat latch knot, and lovers knots throughout. Each 5/16" diamond braid tie off is finished with a copper tip. 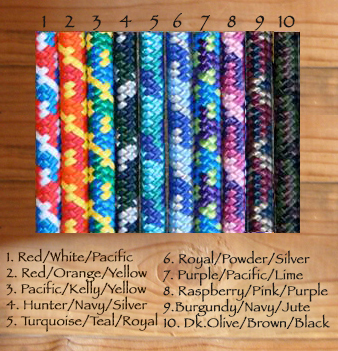 You choose from our 8 main sizes - starting at $15. Custom sizes are available at no extra cost.